I wrote this piece for a wedding, wanting to write something within the Irish tradition but with a modern twist. When you record audio you can capture as many takes of yourself as you like and layer them all of top of each other, but try doing that live 🙂 This video captures the idea pretty closely though, with multiple Cathys on violin and viola! Made possible by the wise and clever people of Kerbute Productions. 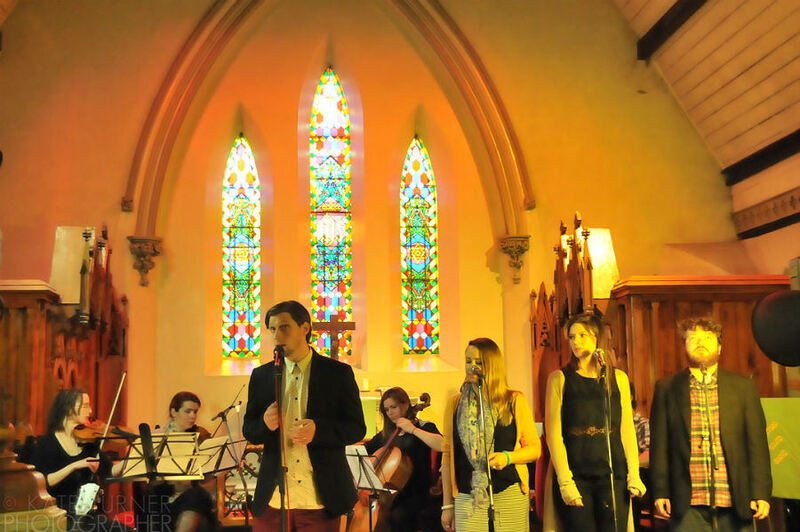 Gardiner Street Gospel Choir are fresh from a terrific performance at the Five Lamps Arts Festival on April 7th, and are now revving up to headline the Gospel Rising Festival as well as singing our hearts out at mass every Sunday night in ‘God’s gaff’ (St. Francis Xavier’s Church)! and Sandymount Gospel Choir are looking forward to their annual concert on Fri. 24th May, as well as to performing in the small hours of the morning on May 11th for Darkness Into Light for Pieta House. The Gospel Project are back on wedding duty, the bells having started ringing as soon as Spring kicked in. As usual I’ve been on fiddle duty with the The Whole Hog throughout the year, see our website for forthcoming gigs and events. Also check out the monthly Cabin Sessions gig in Dundrum, on Thursday 25th this month – some of the finest Americana music to be heard in Dublin, and it’s free! My return to the wonderful world of Gardiner Street Gospel Choir got off to a rip roaring start on August 22nd with a performance at the RDS for the World Meeting of Families. Portmarnock Singers finished off their choir year with a performance in Kilkenny as guests of the fabulous In Caelo. A lovely performance from both choirs, in St. Kieran’s College, Kilkenny on May 26th. Sandymount Gospel Choir gave a stormer of a concert the same weekend, in the Aviva Stadium (well, nearly! It was Lansdowne Football Club) Footage to follow! Portmarnock Singers also enjoyed a joint concert with Boru choir in Portmarnock at the end of April. I’m an occasional volunteer at St. Lawrence Home of Hope , Zambia, an inspiring project which has transformed the lives of many boys and young men living on the streets of Lusaka. Last November I ran a fundraiser for the project, which brought in over €2000. Presenting the contribution to the Home of Hope was a great feeling. Thanks so much to all those who so generously donated. I was rather pleased about this. I received a Travel & Training Award from the Arts Council of Ireland to travel to the U.S, to St. John’s University, Minnesota, where I attended an amazing course with the prestigious VoiceCare Network, learning in greater depth about vocal pedagogy, and further developing my skills as a choral conductor. A brilliant opportunity for which I’m very grateful. July 2015 Heard You Call My Name released! Penned by yours truly and performed with raucous energy by The Gospel Project, this first single from the Letters to Loved Ones EP is guaranteed to have you humming and clapping along. Or your 99c back 🙂 Enjoy. 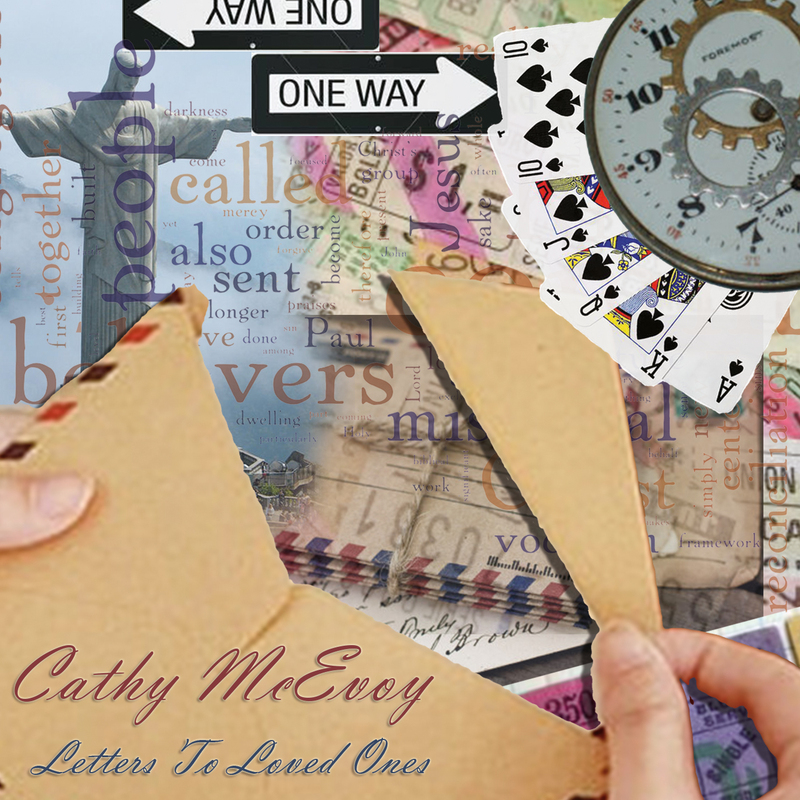 Letters to Loved Ones EP now available to download! Sure why not buy the whole EP while you’re at it. Yes, it’s finally happening. It’s been epic. Singers have lost their voices. Files have been corrupted. Engineers have disappeared from the face of the earth. But a few broken strings and quite a few grey hairs later, Letters to Loved Ones has now been unleashed. Just click here to enjoy my quirky blend of gospel, alt rock and folk. I hope you like it. The Bamboo Sessions Quartet with Danny G + the Major 7ths. This was one of the most enjoyable projects I’ve participated in in a long time. A singer-songwriter night with a difference: live string quartet. 6 Dublin-based songwriters – myself, Danny G, Celine Carroll, Edel Meade, Enda Reilly and Sive – performed our own songs and each others in arrangements for string quartet prepared specially for the event. The quartet featured myself and Imogen Gunner on violins, Mary Barnecutt on cello and Niamh Roche on viola. Lovely venue, great crowd and a terrific evening’s music. Who could ask for anything more? On Friday March 13th, a piece of mine for SATB choir, piano, cello and soprano soloist, was premiered as part of Under My Bed in Smock Alley Theatre, Dublin. If you missed it last year, Under My Bed is an extraordinary project; people from the arts world and beyond are invited to write a short piece on the theme ‘under my bed’, the resulting works are then performed over several magical nights in one of Dublin’s most charming venues, and most importantly, vital funds are raised for children’s charity Barnardos. I assembled a special ‘Under My Bed’ Mixed Voice Choir for the event, all of whom are shared their talents freely and out of sheer goodwill.I still can’t believe my good fortune in getting the singers and musicians I did on board. 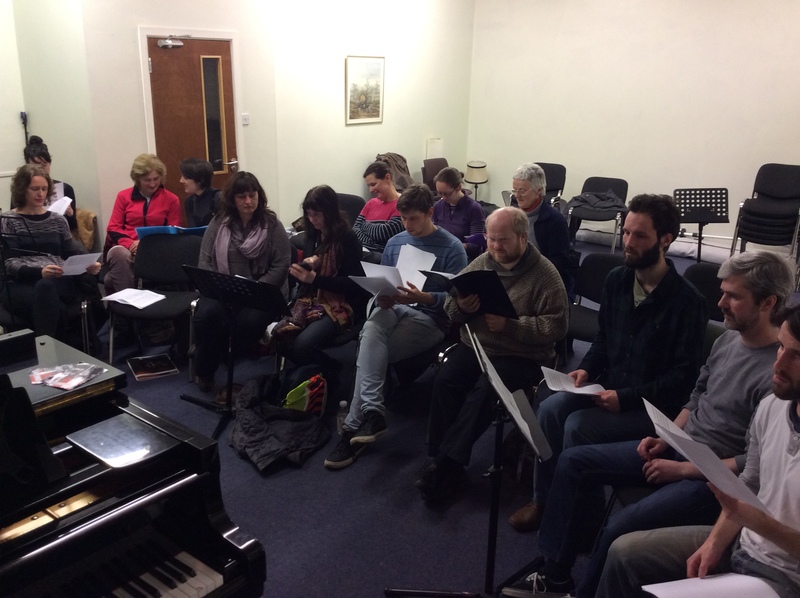 Here we are pictured during rehearsal…the furrowed brows testify to the fact that the piece is a little tricky! But the performance went very well indeed. Delighted to have been part of this marvellous event.